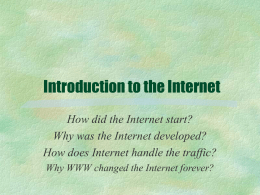 •The Internet began as the Arpanet during the 1960s. Used to transfer files across the Internet. User can upload or download a file. 3. Issuing FTP commands at a text-based command prompt. Allows a user to remotely login to a distant computer site. User saves money on long distance telephone charges. 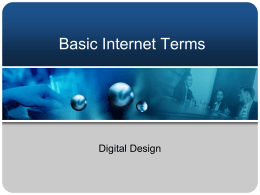 the Internet, and voice over Internet Protocol (VoIP). well, but can be cost effective. as well as reply to, forward, and attach non-text files. 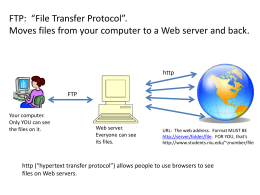 Simple Mail Transfer Protocol (SMTP) is used to transmit email messages. Access Protocol (IMAP) are used to hold and later retrieve email messages. sends a copy of the message to all listserv members. follow a particular area of study. 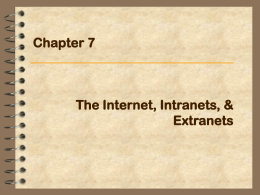 Thousands of Usenet groups exist on virtually any topic. file, which can be heard or viewed on the user’s workstation. (RTSP) support streaming audio and video. The most popular service on the Internet. HTML is a very popular extension to HTML. binding, and cascading style sheets. and the contents of the document. The syntax of XML is fairly similar to HTML. have their own, unique properties. 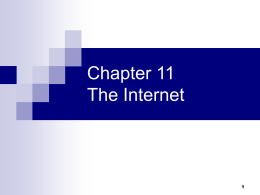 The buying and selling of goods and services via the Internet. hard drive of a user’s workstation. Many consider cookies to be an invasion of privacy. 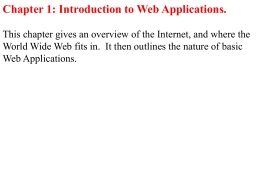 An application, such as e-mail, resides at the highest layer. 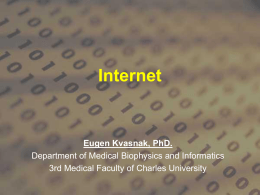 IP prepares a packet for transmission across the Internet. The IP header is encapsulated onto a transport data packet. 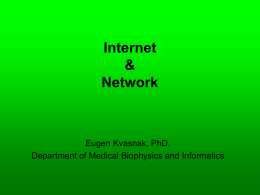 network information is encapsulated onto it. hopping around the network too long and delete it. over a single IP line. TCP can perform end-to-end error correction. 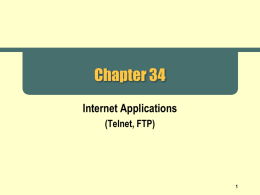 TCP allows for the sending of high priority data. reporting for the Internet Protocol. address, and the packet has hopped too many times. A transport layer protocol used in place of TCP. is used with connectionless applications. but the header is much simpler than TCP. address, a LAN does not use IP addresses to deliver frames. A LAN uses the MAC layer address. frame can be delivered to the proper workstation. The Internet is not normally a secure system. computer system, how can a secure connection be created? URL translated into an IP address? database of URLs and IP addresses. database for URL/IP address information. the next level will be queried. If the root server has the answer, the results are returned. query the server at the domain name’s location. and a unique host address size. Sometimes a device is permanently assigned an IP address. This is called static assignment. accesses the Internet. This is called dynamic assignment. many devices can share a smaller pool of IP addresses. Internet at the same time. 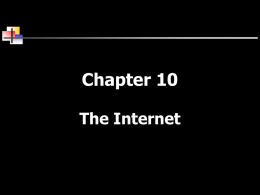 The next version of the Internet Protocol. businesses and universities in the US. 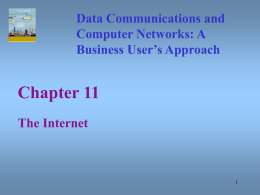 Internet2 will support very high speed data streams. Internet via their local Internet service provider. This local access will help keep telephone costs low. 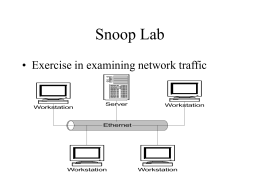 software to support virtual private networks. from the users’ homes into the corporate computer system.